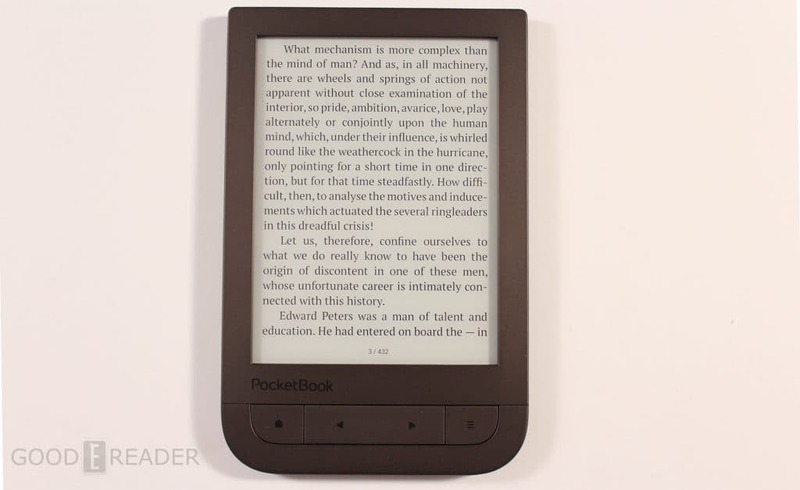 The Pocketbook Touch HD 2 has just been released and the most compelling aspect about this new e-reader is that it features a 300 PPI screen and a new lighting system that warms the screen. It also has audio functionality so you can listen to an audiobook or music while reading an ebook. The Pocketbook Touch HD 2 features a six inch E Ink Carta display with a resolution of 1440X1080 and 300 PPI. It uses a IR sensor, which is the same screen tech the new Nook Glowlight 3 utilizes. Underneath the hood is a 1GHZ processor, 512MB of RAM and 8GB of internal storage. There is a MicroSD card to enhance the storage up to 32GB. You will be read for around a month on this device without having to recharge, thanks to the 1500 mAh battery. The PocketBook Touch HD 2’s big selling point is the new SmartLight screen which will adjust the color temperature depending on the time of day. There are two modes of SMARTlight adjustment. The automatic one, which is set by default, works depending on the time of day. It offers an optimal variant of lighting: soft and warm for relaxed reading in the evening or more intensive for the more active hours of the day. Basically, the automatic mode is dependant on the clock, so make sure your timezone is correctly set. The other mode is manual, which you can use the scroll bar and optimize the lighting experience. 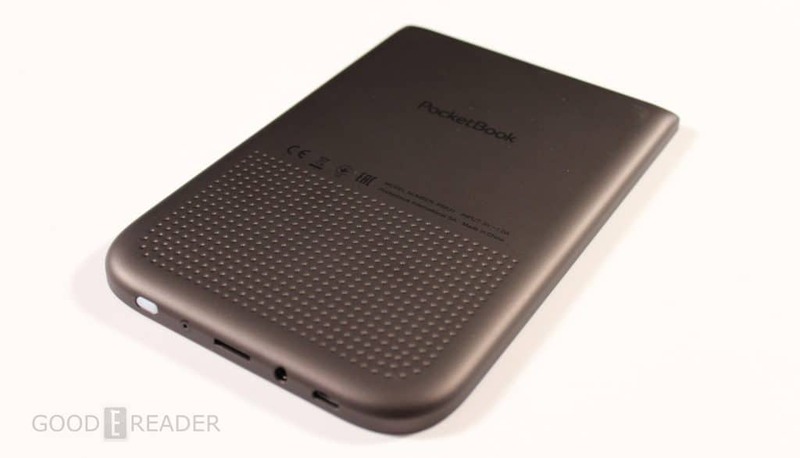 Pocketbook is one of the few companies operating in the e-reader space that have supported audio for many years. There is a 3.5mm headphone jack that will allow you to listen to audiobooks or to enjoy music while reading. PocketBook Touch HD 2 supports the mp3 format and a Text-to-Speech function, which converts text into spoken voice, the e-reader will read aloud any text file in any of the supported formats. The dimensions of only 113.5 x 175 x 9 mm and the low weight of 180 g make the e-reader a perfect companion for people on the go. Thee overall design of the Pocketbook Touch 2 is inspiring, it really looks like a unique device. The back of the unit is nice and smooth and then halfway down there it is perforated, which makes it immune to fingerprints. The front has a number of physical buttons, including a back, home and two manual page turn keys. I really dig devices that allow you to flip pages of an ebook by using the touchscreen or page turn keys. I find this is really useful when you are holding it with one hand and it’s counterintuitive to swipe/gesture. The settings menu has some default options, such as page refresh speed and firmware updates. If you want to borrow ebooks or audiobooks from the public library or purchase digital content from other booksellers, the Touch HD 2 has Adobe DRM support. This will allow you to enter your Adobe login and password on the e-reader and then use Adobe Digital Editions to copy it to your device. Many e-readers do not have this kind of support, because Adobe license fees are really expensive. 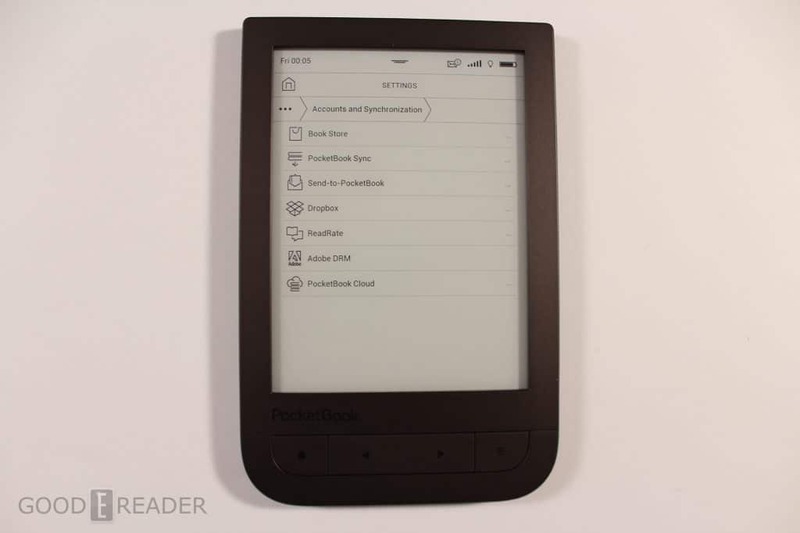 The Pocketbook Touch HD primarily supports EPUB and PDF files. It does not have a dedicated digital bookstore, so you will have to sideload in your own content or borrow them from the public library. Luckily this device supports a wide array of ebook formats; PDF, PDF(DRM), EPUB, EPUB(DRM), DJVU, FB2, FB2.ZIP, DOC, DOCX, RTF, PRC, TXT, CHM, HTM, HTML, MOBI, ACSM. The library of the e-reader contains 97 preinstalled free e-books in 14 languages, including 7 in German and 8 in English. Reading with the preinstalled Abbyy Lingvo dictionaries will help to improve foreign languages skills and appeal to users all over the world. Overall the reading experience is really enjoyable. They have like 12 different font families that will appeal to people of all ages. Page turn speed is robust and there is little to no ghosting. 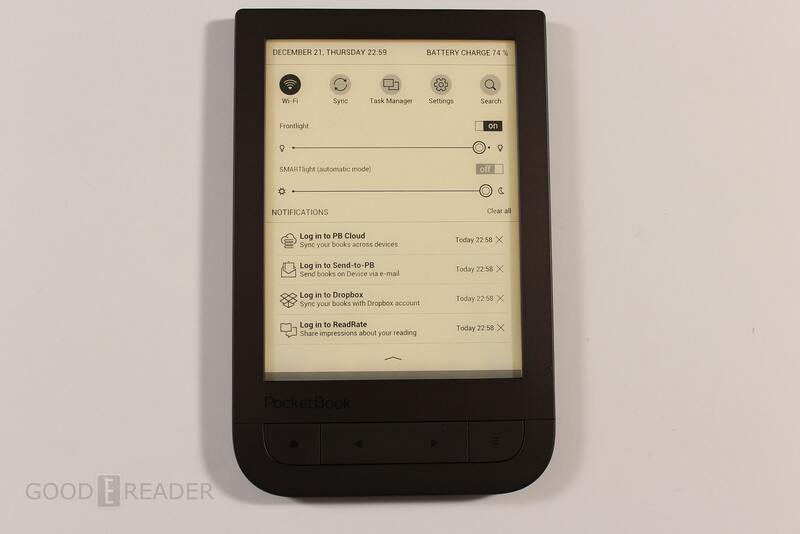 This is the first Pocketbook branded e-reader that has the same lighting system as the Kobo Aura One and the new Barnes and Noble Nook Glowlight 3. The one big advantage Pocketbook has over both of these companies is that it supports audio and does not lock you into a specific ecosystem. I think Pocketbook has been really on fire lately. In 2017 they released the Aqua 2, a waterproof e-reader and the Touch HD, which is similar to this device, sans the new lightning system and a 3.5mm headphone jack. All of these units are designed well, have solid hardware and standout in a crowd. 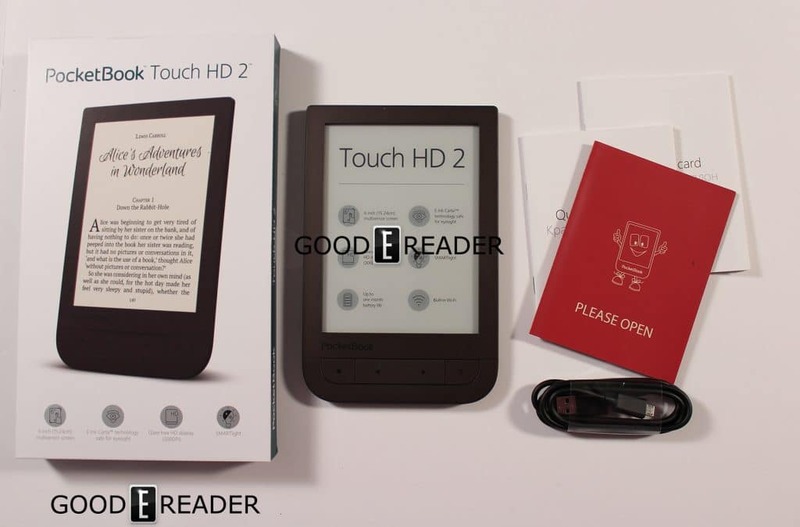 The Pocketbook Touch 2 is recommended for people who do not want a mainstream e-reader like a Kindle or Kobo. You can use it anywhere in the world and the UI will optimize itself to your specific region, it has a ton of dictionary support and the reading experience performs well. This e-reader will be available soon in the United States, pricing is not available. So that makes Kindle, what? The only e-reader line NOT to adopt rgb lighting?? Guess Jeffy Bezos is too busy making his billions to care about keeping up with the competition and as long as the Amazon Bois keep drooling over what has become an outdated device, there’s not much reason to keep up. It will be available on the main Pocketbook website and Amazon when its released. Can you turn off the touchscreen as with ink book prime and the oasis? Just added a review video, check it out.